I bought a single bunch of bushy-topped carrots the other day. At first glance it was a good looking cluster - bright orange in color, vibrant greens still attached. But it was on second glance that I noticed the tiny carrots nestled beside their larger brothers and sisters. Some of the smallest carrots were no thicker than a knitting needle, not much longer than my pinky finger. I snacked on those after a quick rinse. The bigger guys I put to work in this dill-flecked white bean skillet salad. 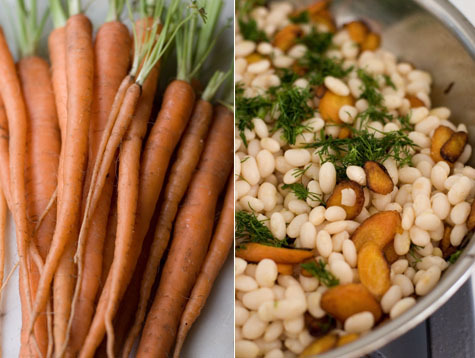 Nothing too complicated - warm, coin-shaped slices of golden, pan-fried carrots, white alubia beans and chopped dill tossed with a tangy-sweet lemon shallot dressing. It tastes good the day you make it, even better the day after. And although it's certainly not as pretty, in my opinion, it might have tasted best on day three as the shallots infused the beans and the lemon mellowed. Look for young carrots with their greens still attached - you can get a good sense of whether the bunch is fresh or not. On the bean front, I cooked the alubias from scratch, but you can use well-drained canned white beans if you want to throw this together on a whim. I like to buy young carrots at the farmers' market - slice them slightly thicker than a banana chip for this salad. A twist on the ubiquitous black bean salad - giant black beans and toasted almonds are tossed with a honey-jalapeno-lime dressing and served with a bit of crumbled feta over a bed of baby arugula.